Assaf Manor, Assistant Professor Carmel Rotschild and Nimrod Kruger at the lab. 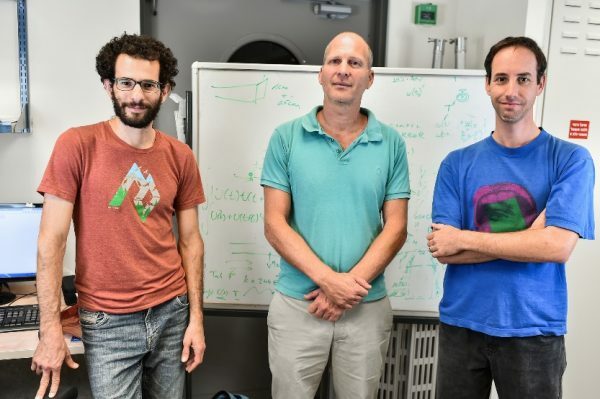 Technion researchers have developed a technology that could improve the efficiency of photovoltaic cells by nearly 70 percent. The study was conducted at the Excitonics Lab, headed by Assistant Professor Carmel Rotschild at the Faculty of Mechanical Engineering, with the assistance of the Grand Technion Energy Program (GTEP) and the Russell Berrie Nanotechnology Institute (RBNI) at the Technion, and as part of the lab’s ERC project on new thermodynamic tools for solar cells. The sun is a powerful source of renewable energy. In fact, it is currently the only energy source capable of supplying the energy consumption of the human race, so it’s no wonder that the use of solar energy is increasing. But there are currently a number of technological limitations when it comes to photovoltaic cell efficiency. Photovoltaic cells optimally utilize a very narrow range of the solar spectrum – the broad light supplied by the sun; radiation not within this narrow range merely warms these cells and is not utilized. This energy loss limits the maximum efficiency of current solar cells to around 30%. The Technion team’s method is based on an intermediate process that occurs between sunlight and the photovoltaic cell. The photoluminescence material they created absorbs the radiation from the sun, and converts the heat and light from the sun into an “ideal” radiation, which illuminates the photovoltaic cell, enabling higher conversion efficiency. As a result, the device’s efficiency is increased from 30% (the conventional value for photovoltaic devices), to 50%. The inspiration for the breakthrough comes from optical refrigeration, where the absorbed light is re-emitted at higher energy, thereby cooling the emitter. The researchers developed a technology that works similarly, but with sunlight. The group hopes to demonstrate a full operating device with record efficiency within 5 years’ time. If they are successful, they feel could become a disruptive technology in solar energy.